The discussion about animal intelligence and emotions has been heavily debated throughout the ages and like a rollercoaster, these ideas have come and gone, especially when religion is involved. Of course, this is where Humanimal comes into the picture and whether mankind has misjudged this sometimes humble creatures known as animals. This extraordinary documentary goes into detail about the possibility that animals are more intelligent than we believe and that like humans, they have a wealth of emotions. I’ve also believed that animals have emotions and one only needs to look at our pets to see how they react to a variety of different situations. For example, my own dog has been sad, happy, bored and excited to name a few of the facets that she has displayed. This documentary is not fiction but rather a carefully collected depository of ideas. The best part of this documentary is that it uses both scientific evidence and anecdotes to portray the theme of this series as we are taken on a very interesting journey about a plethora of animals that have to some extent been integrated into society. We already know that animals can learn and memorise and that some species have their own language but throughout this documentary, we discover that animals can dream and even adapt themselves to certain situations and whether this is primal defence mechanism or an act of higher intelligence, the series opens up the doors for further debate. Another interesting part of this documentary is that apart from modern evidence such scientific studies or investigations into the behavioural observations, it also uses historical evidence such as how certain cultures hold certain animals in high regard to make this series even more compelling. With so much evidence presented in this series, it’s hard not to get caught up and truly believe because next time you see that dog or dolphin, you’ll be looking at them in a different light as opposed to just another animal. 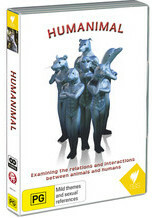 Humanimal comes on 2-discs and is presented in widescreen with Dolby Digital 2 and is probably a little lacking in terms of video quality compared to some other releases, more specifically from the BBC. Even so, it successfully manages to get the message over to the viewer and after 250 minutes of thoroughly interesting information, I found this documentary one of the best that I have seen all year. Recommended!